Bom, e por muito que eu goste de dar um pop de cor, manter-me só na zona dos neutros em outfits é das minhas coisas preferidas. Ainda pensei em usar uma carteira de cor, mas depois....depois fui ao quarto da minha irmã e roubei-lhe esta. Tenho de admitir que dá um jeitão ter uma irmã com gostos (pelo menos em carteiras!) semelhantes aos meus ahahah! Girls, I know that've been kind a off lately! Shame on me! I have to try to get back to my supposed sechedule post's routine, but it's have been easy to do it during this week! I'll try to keep the posts coming during the rest of this week! There is something about white lace blouses that always make me look at them twice. I often say that if I ever would create something from the root (I'm talking about clothes - you know, this is one of those mental daydreams that I have and I don't need to get drunk to have them ahah!) 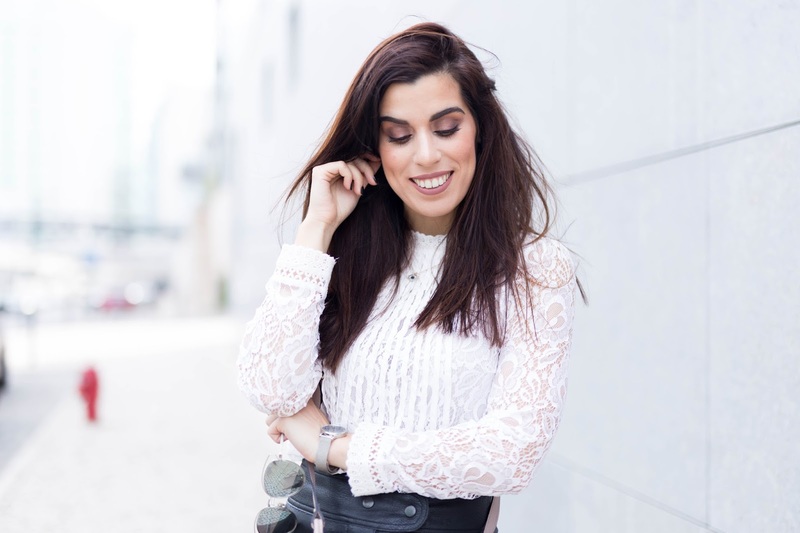 I would have to make a white lace shirt because it's something that I feel that it's so essential in our closet (it gives us so many great options! ), and besides that, I live in them, can you notice? Well, and as much as I love to give a pop of color into my outfits, keeping things in the neutral zone is one of my favorite things. I even thought about wearing a colorful bag, but then .... then I went to my sister's room and I stole this gorgeous bag from her! I have to admit that having a sister with similar tastes (at least in bags!) is awesome sometimes ahah! É que nunca consigo vir aqui e pensar "hoje não gosto"! Incrível tamanha perfeição. É o look, é o cenário, é o cabelo, é a maquilhagem, são as fotografias.... tudo em sintonia perfeita, tudo maravilhoso! como te invejo eheheheheheh. Estavas tão mas tão linda princesa! Essa camisa é a coisa mais fofa! O teu cabelo está com um tom lindo, cada vez mais longe dos dramas do preto! You know I love black and white! You look gorgeous. I love the whole outfit, so cute! Such a lovely blouse. I love the fine detail. The skirt is so cute with the pockets. Que fotografias lindas, e que outfit elegante! Adorei!! I love the entire outfit!! Specially your sandals!! So cool! Honey, your style is always SOOOO flawless I love it! Your are such an inspiration for me!